Corporate boards of directors set policy, hire and fire CEOs, and have a huge influence on company behavior and culture. 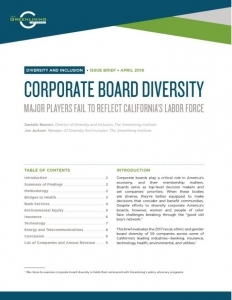 We examined the corporate board diversity of 59 companies with a major presence in key sectors of California’s economy and found that they consistently fail to reflect the state’s diverse labor force. Women and people of color were consistently underrepresented and in some cases missing completely. When board diversity so badly fails to align with the labor force, companies can more easily make mistakes that alienate groups of customers and miss chances to make their corporate environments welcoming to diverse employees.